This is the most amazing hike I've done in south west Nigeria! 3,000 feet above sea level. can you beat that? 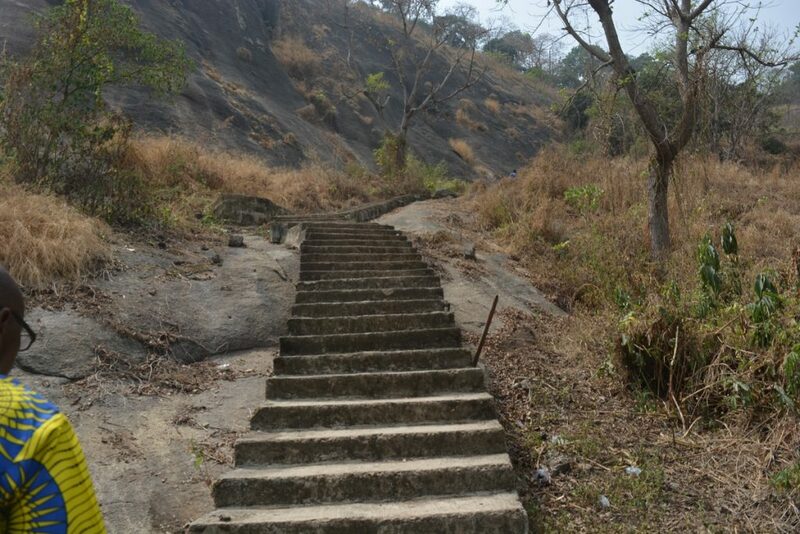 The tiring spell at Arinta waterfall and Ikogosi, combined with the brutal journey from Lagos the previous day conspired to create in me an illusion that waking up might be impossible. I snoozed my phone’s alarm multiple times. Everything seemed to be against me. The cold was fierce, the hotel rooms had no heater, my muscles ached like I had gone to the gym for the first time. I woke up few minutes to 8am as against the targeted 7am. I pitied Damola on seeing him take cover under his pillow. I woke him up, we discussed the day’s itinerary, packed our bags and checked out. I had earlier placed a call through to David so he could come pick us up, but he seemed to be having a good time with his wife because I could hear a female mumbling at the background so I let him be. “A widower will find it difficult surviving in places like this.” I grinned as I stuffed my things into my backpack. Re-accessing my footwear to be sure it was up to the day’s task. By 8:20am we were already on a bike which would take us to the junction where cabs going directly to Ado Ekiti were loading. I could tell my blood was freezing but we were already halfway into the journey. I asked Damola if this was how it’s been all year and he nodded in affirmative as colder breeze rushed into my hairy nostrils. In a journey which took like forever, we arrived at the junction and just like we were being waited for, we jumped into the rickety cab, dumping our bags in the trunk. 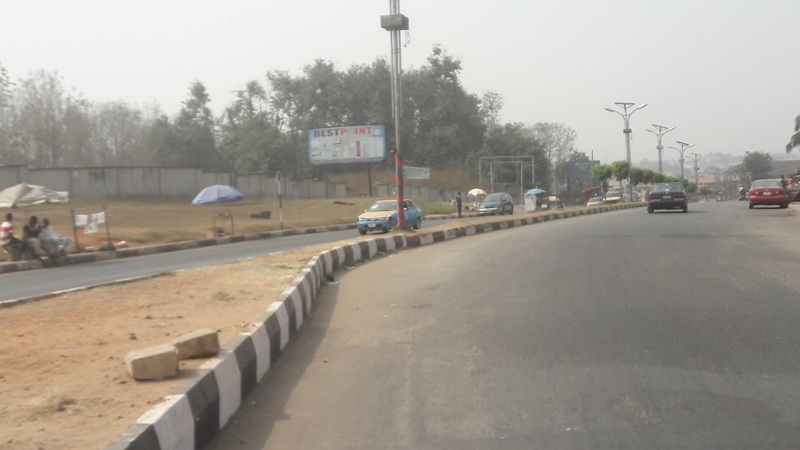 The bike man rode away after being compensated with N100. The journey to Ado took approximately 1 hour and exactly N300 per person. 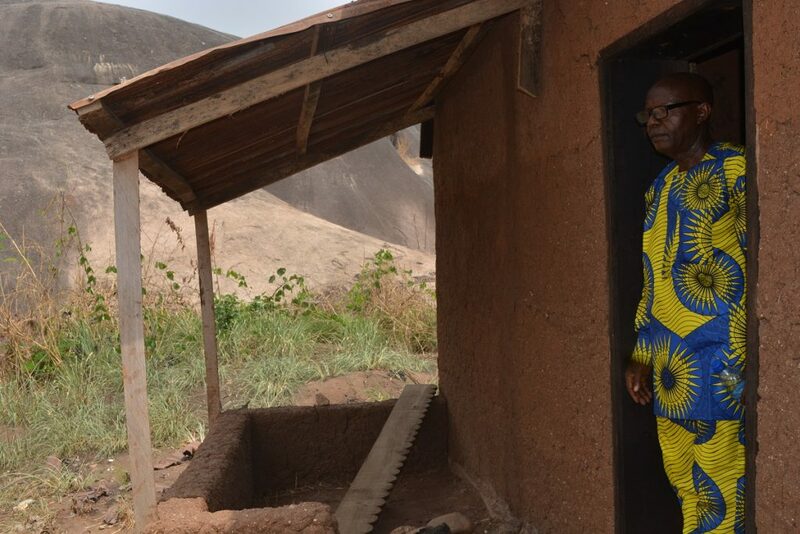 It was difficult but I had to say goodbye to Damola as I joined a space bus to Akure through Ikere Ekiti. The journey made me part with another N800 which I didn’t regret. Akure unlike Ado Ekiti was warm and less lively when I got there by 10:30am. I missed Damola for most part of the journey but I compensated myself with more pages of ‘outliers’. The journey gradually became more difficult as I had to do more talking to strangers, asking for directions. The thing with solo trips is that more often, your life depended more on God (if you believe one exists) and the locals (whether or not you like them), hence the need for your personal relationship tools such as smiling and greeting. Following tons of advice from locals, I motioned a bike to take me straight to Idanre Garage where I was told cabs taking travelers to Idanre hills are stationed. I was the 2nd passenger aboard the 6-sitter cab which was originally designed by Toyota to carry just 4 people, but who was I to rebel against a lifelong tradition? Even if I would, it would be unwise to try that several kilometers away from home. Two more passengers joined before I jumped off the cab, reported myself to the driver and paid my fare (N400 ). I was back 10 minutes later with two bottles of water under each armpit and a black nylon bag containing diced roasted yams. 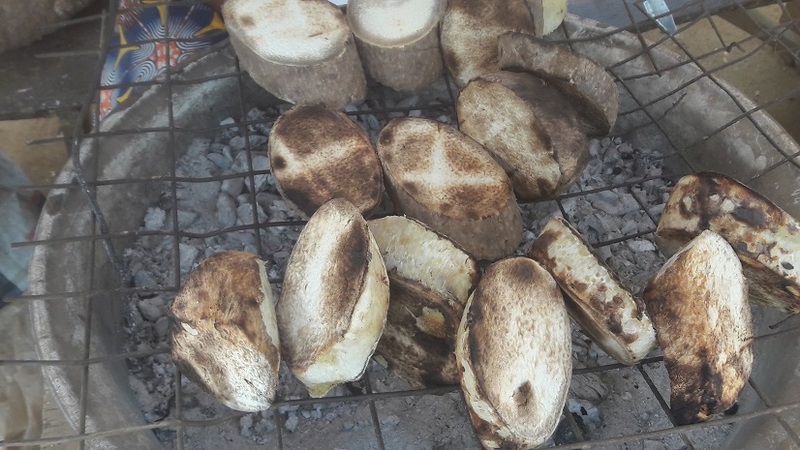 Whatever the farmers in Ondo use in growing their yams… I regretted buying just 2 slices. 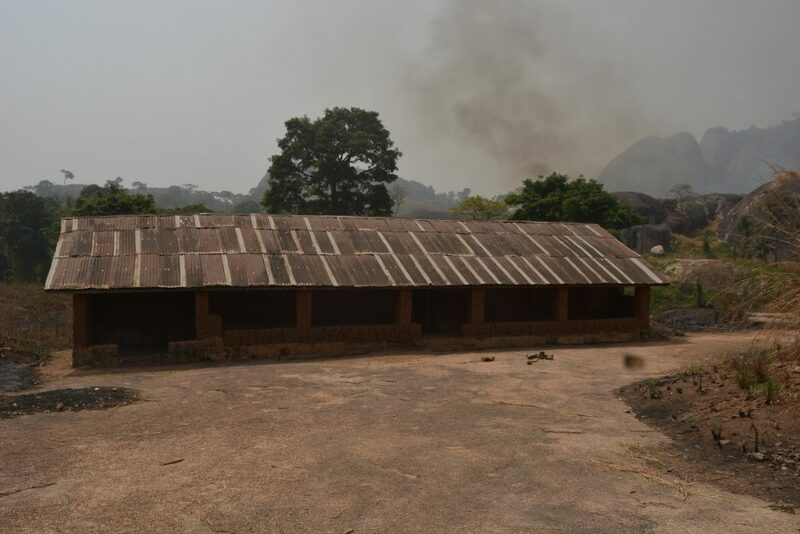 The journey to Idanre started almost immediately when an elderly woman slowly hopped in. 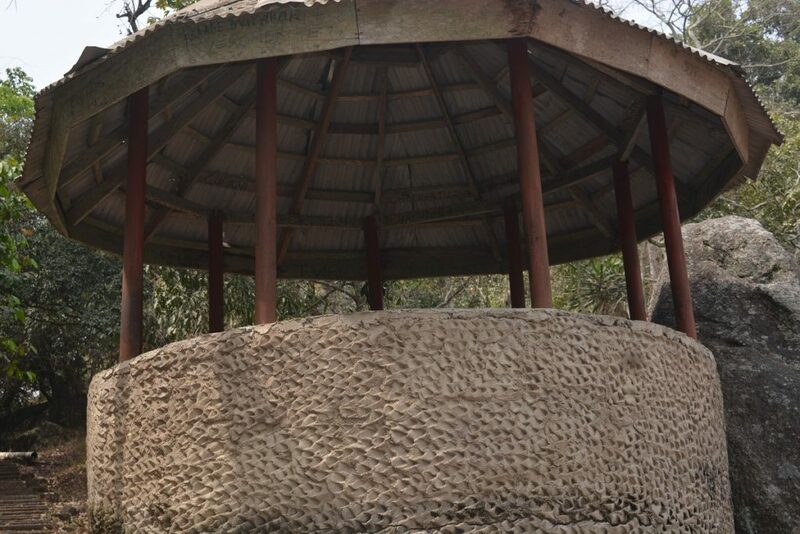 Prior to this trip, Badagry and Olumo rock have won my heart in terms of organization and attitude towards visitors. On sighting me at the gate, the 5 of them parted their lips, letting out different shades of smile. It was obvious they were all happy as I immediately felt welcomed. The breeze escaping through the woods continuously attacked my face. I didn’t bother restraining them. 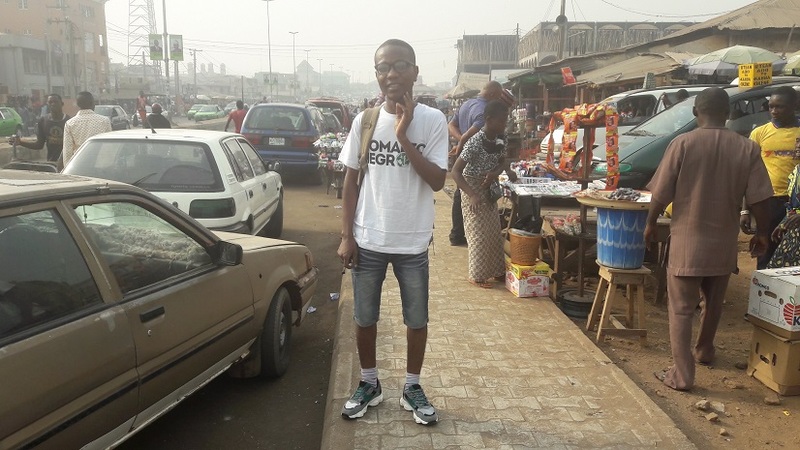 Haven’t you read about my trip to Badagry? In search of a place to reflect on life? I greeted and they returned the gesture before introducing themselves on after the other. 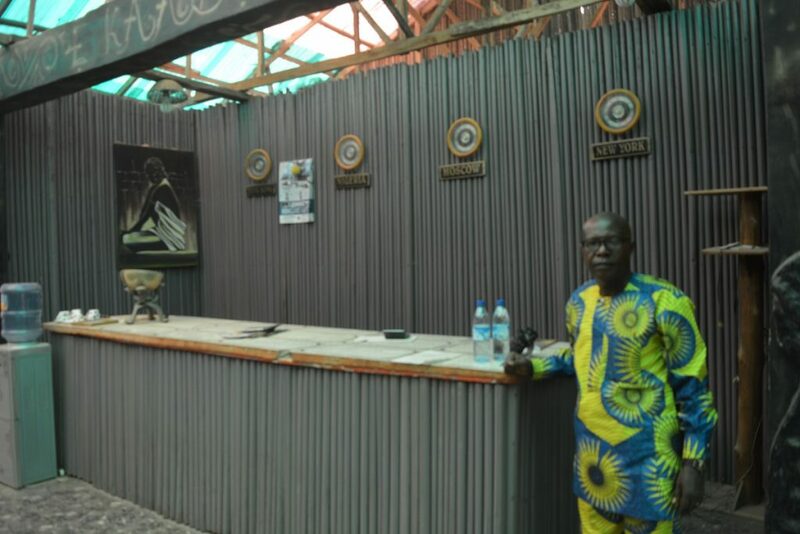 I felt more pleased as I was introduced to my tour guide Mr Paul Bamigbaiye who led me to a large beautifully designed space which served as the reception where I made payment after being given the breakdown. It costs #1,000 for an adult and #500 for children. this is excluding the tour guide’s fee which has to be negotiated. This is the reception. Who else can see my bottles of water right beside Mr Paul? How about the water dispenser? Leaving my bag behind, I held closely my bottles of water with my camera strapped round my neck while I listened to the briefing of our proposed journey by Mr paul. 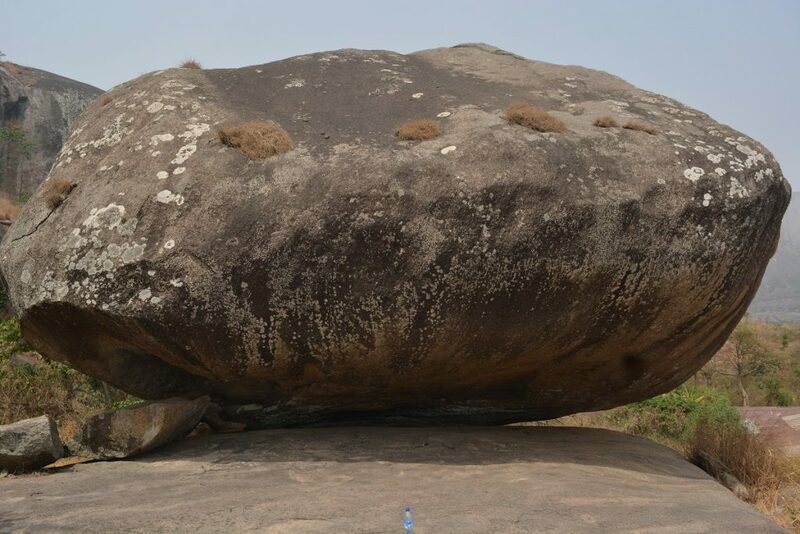 Fact: Idanre Hills was added to the UNESCO World Heritage Tentative List on October 8, 2007 in the Cultural category. 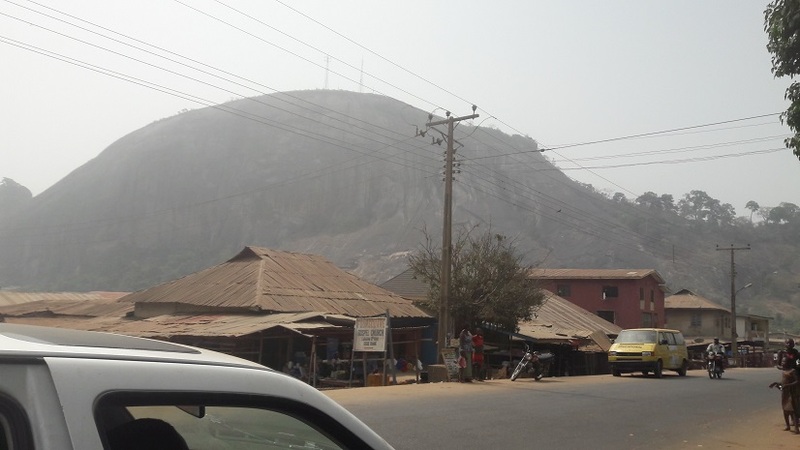 Idanre is classified into 2 (the ancient one atop the hills and the modern one down the hill). – the ancient palace et al. My heart skipped on hearing that we have approximately 700 steps to climb before getting to the summit (but with 5 resting points). That’s crazily more than that of Olumo and Ado Awaye. But hey, “I’m up to the task” I said to myself, beaming a soft smile as Mr Paul summoned me to follow him. 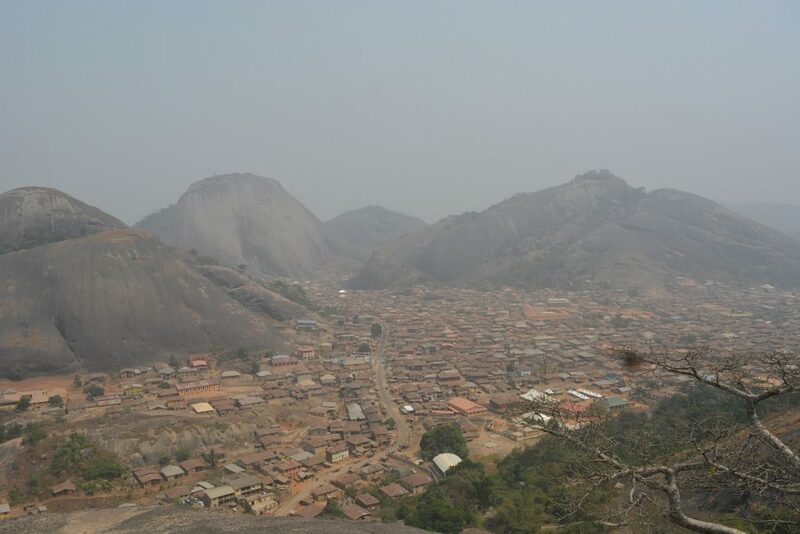 Idanre hills (914 meters) will still be taller than Olumo rock (137 meters) and Zuma rock (725 meters) If put together. My first step of several hundreds.. I didn’t bother asking why because I’m more than eager to climb as I did a quick scan on my mind to see if anyone warranted a curse from me. No one, save for the Nigerian government who have done nothing really impressing to harness the potentials of tourism in the country. But since they on a daily basis get cursed by other citizens, I tuned down my rage, switched to my prayer mood saying stronger prayers for Mr Tayo Sonuga, the Managing Director of Haven Homes who funded my trip. Before long, we were at the first resting point. 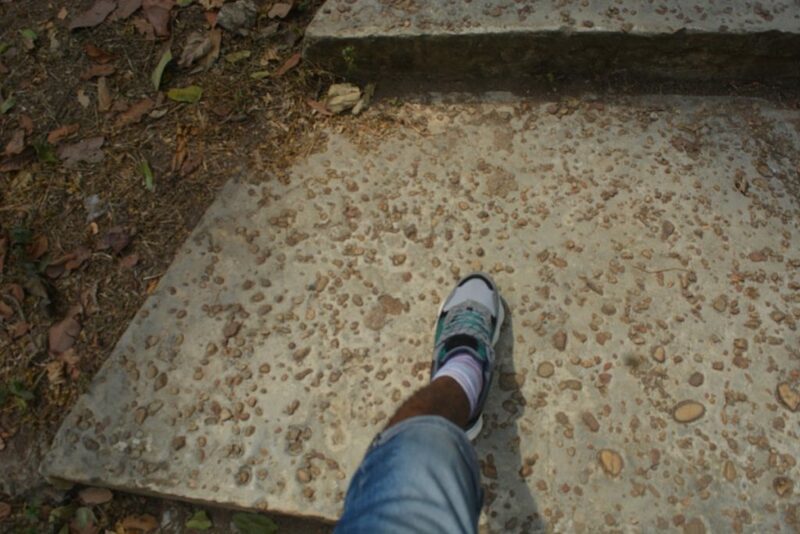 Mr Paul said we had taken 75 steps. Though I felt we had taken fewer so I decided it wasn’t time to rest. I gulped a mouthful from my bottle, offered Mr Paul some but he declined. We continued with 150 more steps to reach the 2nd resting point and another 137 to get to the 3rd. I decided to rest, gulped even some more fluid and took some more pictures. 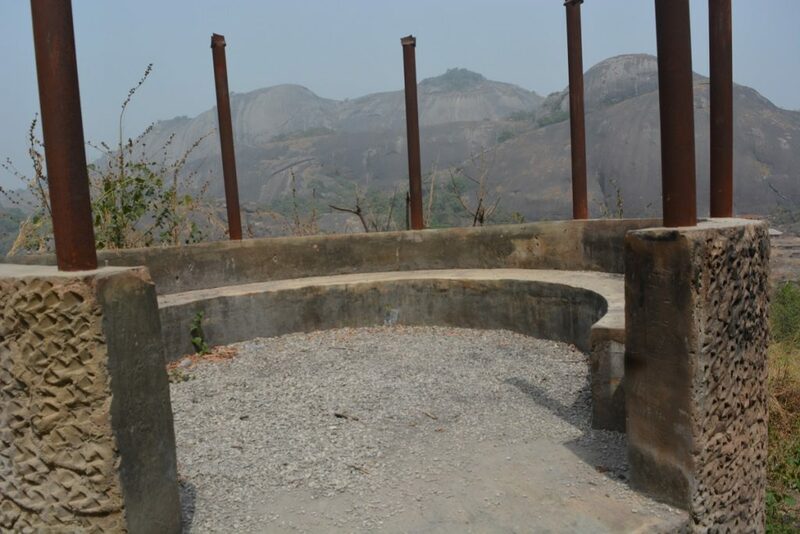 All along I engaged Mr Paul, trying to know why the Idanre hills is in such a dilapidated state. 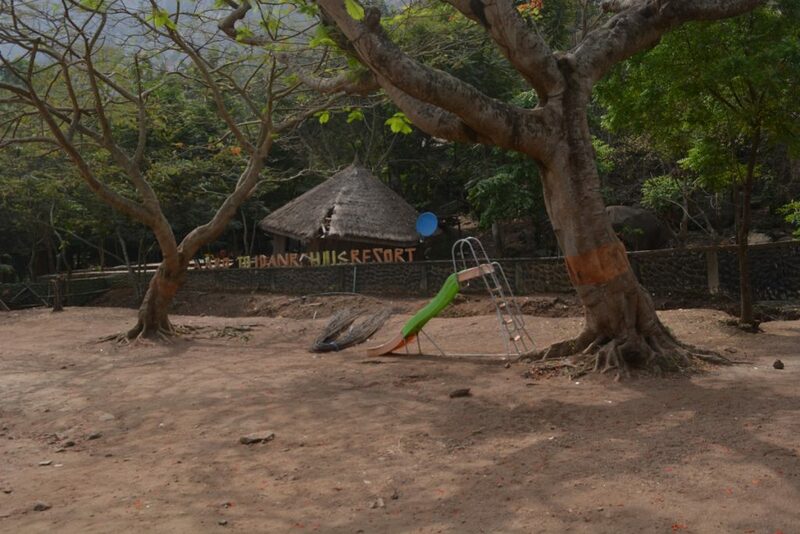 Starting with a deep breadth, He responded by explaining how the previous government had decided to do a face-lift for the resort by inviting an engineer who started out with the beautification but couldn’t finish due to his replacement by the new government. I probed further by asking if tour guiding is what he does full-time, he answered yes but lamented about its numerous inadequacies. He currently doesn’t get any salary except commissions based on how many trips up the hills he’s able to complete periodically. 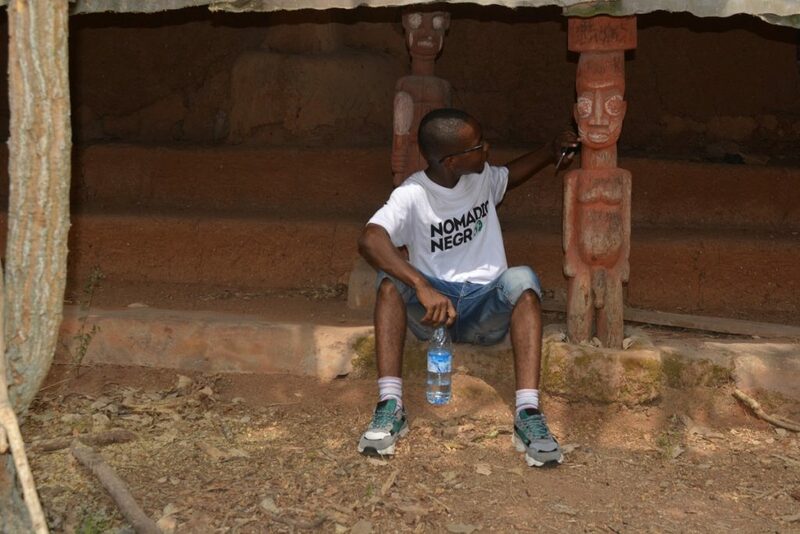 I imagined how crazy survival will be for him considering the poor attitude of Nigerians to tourism. No thanks to the bad roads and very high cost of living. I was tempted again to say few curse words but refrained on remembering the warning I got downstairs. 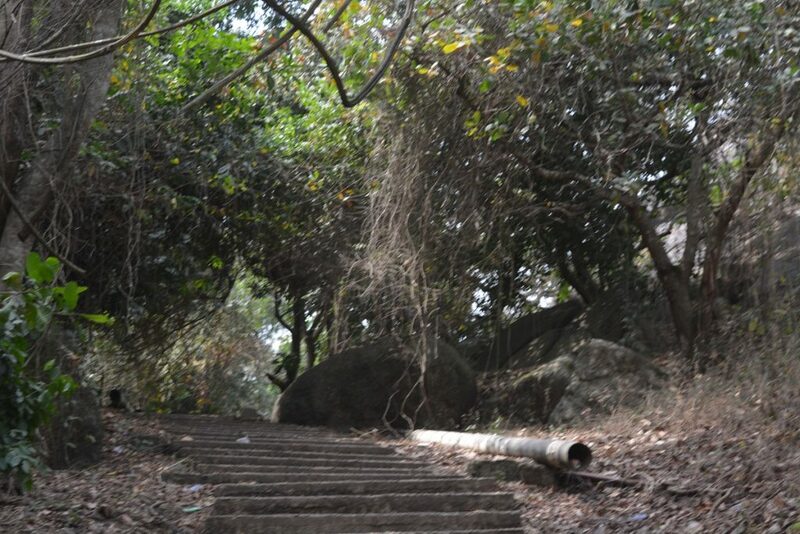 We soon got to the topmost part of the hills after taking 320 more steps. 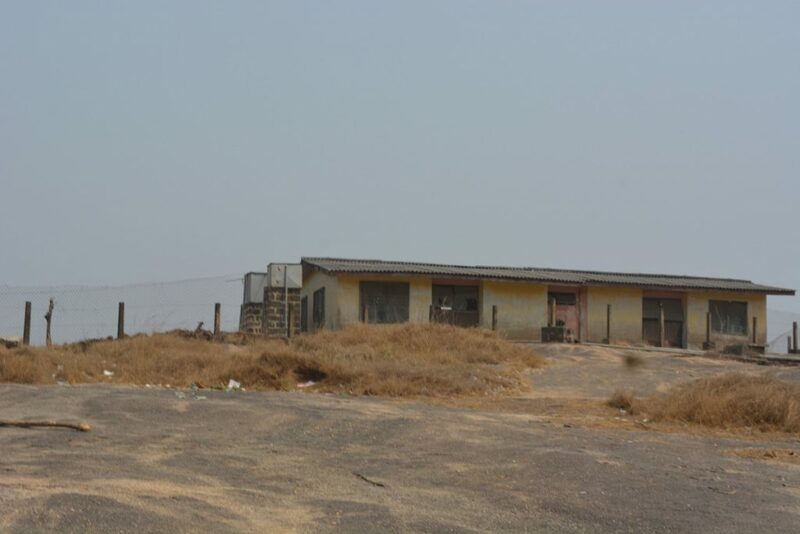 My legs had started to ache but the views into the new Idanre town was mind-blowing as we were greeted on the left by dilapidated chalets which must have been deserted for a long period of time. 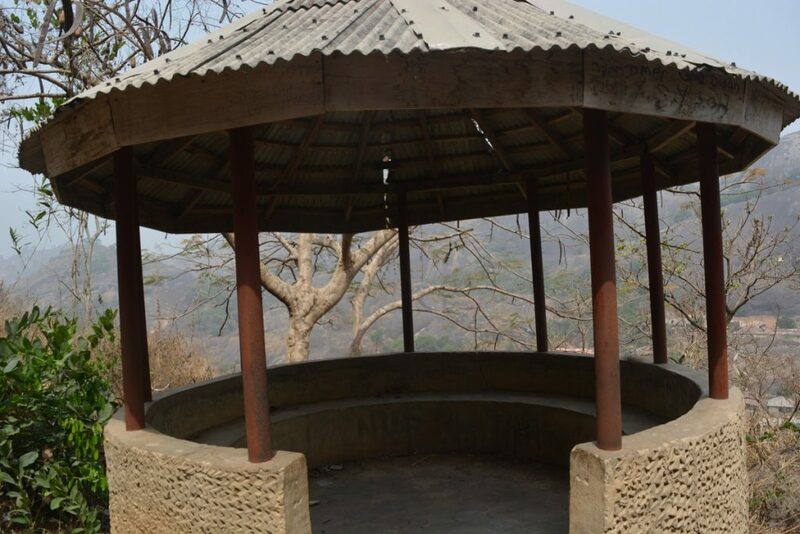 They’ve been built specifically for tourists who’d like to pass the night atop the hills. 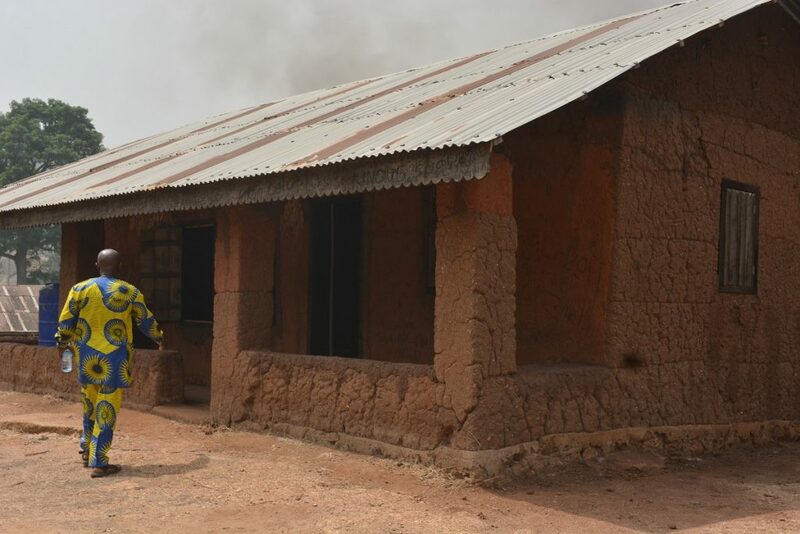 In saner climes, revenues from these chalets would have been put to more efficient use. But again I was at the tip of the peak. I don’t want to risk anything so I suppressed my rage. No curses. After more than 50 pictures and several video recordings, we left to explore other parts of the ancient town. The sun seemed to be mating with the trees as they combined to bless us with an amazing kind of breeze as I gulped more liquid from my bottle. This way to the Jungle. We passed by the thunder river where Mr Paul stopped to tell me the story behind its name. According to him, there was an unusual drought in Idanre town during the war against the people of Oyo who were with just one goal at the time- take over as many territories as possible. As the condition grew worse without rain, the priests in conjunction with all medicine men in the land converged at that spot to say some prayers. During the course of their prayers, thunder struck and it rained heavily that night so much that it flowed continuously to form the river. 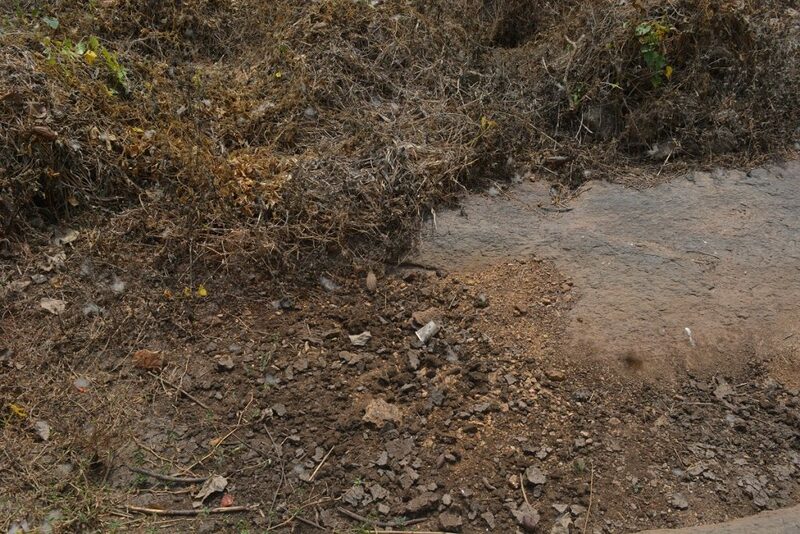 “This Thunder river also contains some magical powers such that whenever the warriors were going to war, they have to drink from it and also confess their satisfaction, else, they will only go and not return from the battle. 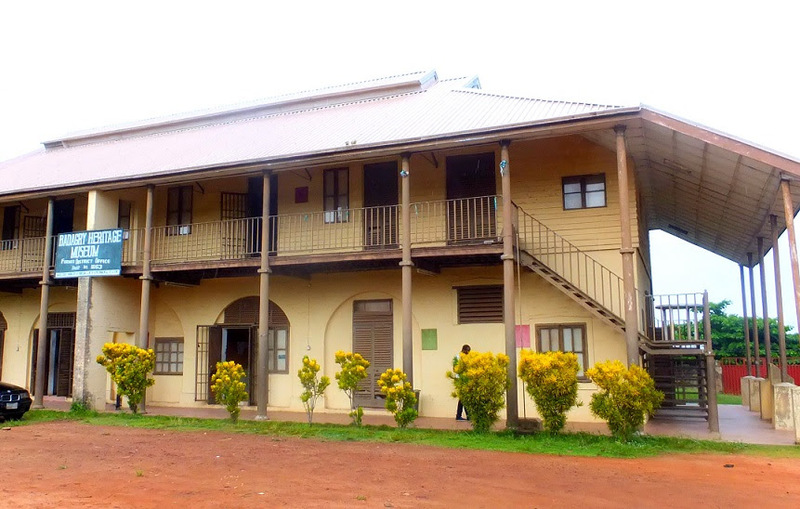 Built by the colonialists in 1896. 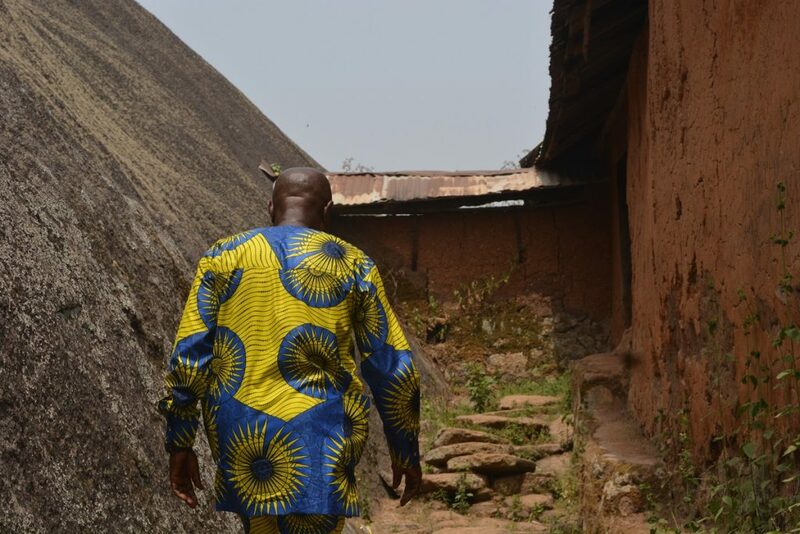 We soon got to Odeoja, (the market square) passing through a path called Ese Ogbeji, meaning walking side-by-side, two people cannot pass through at the same time due to its narrowness. The deep valleys on both sides made it more frightening. During wars, this spot served as the checkpoint where all unauthorized beings were fed to the valleys. 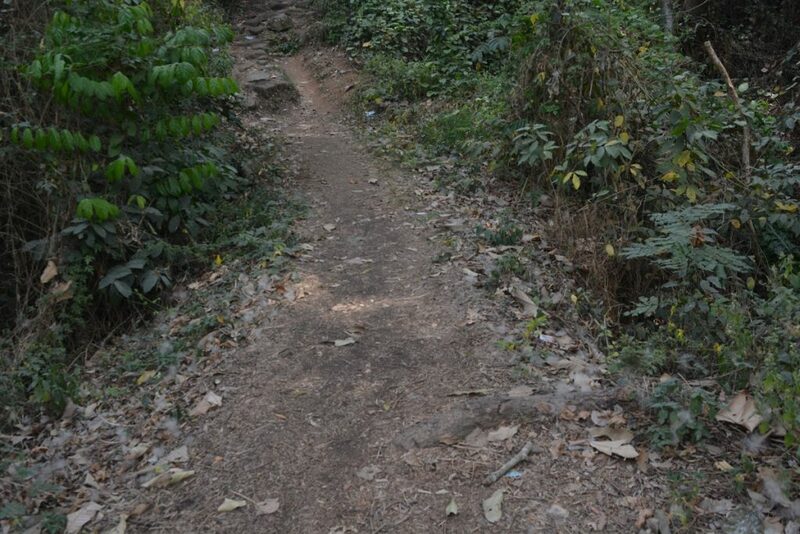 Horrible thoughts paced round my heart as I requested that we continued into the forest. 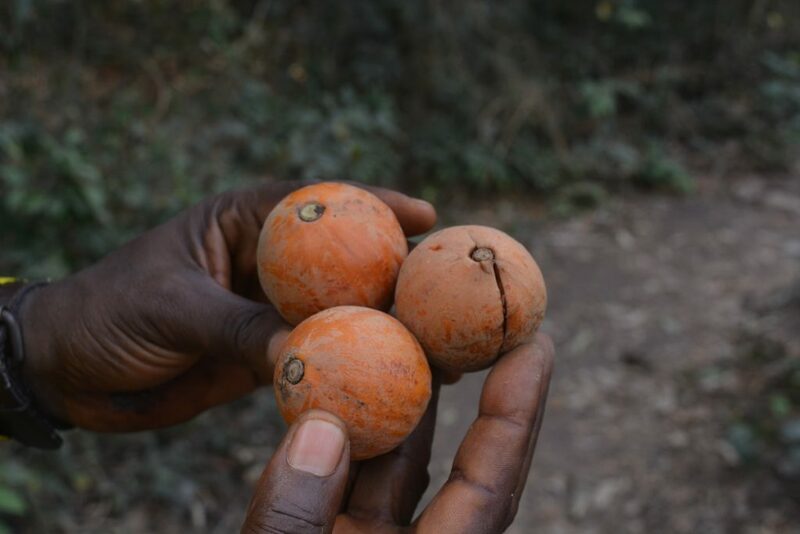 We soon stumbled into an ‘agbalumo‘ farm where a number of them were lying helplessly on the withered leafs on the floor. We helped them by stuffing them into Mr Paul’s pocket till there was no more space. Venturing further into the forest, we saw about 6 bees having a field day pursuing one another. I guessed their queen must have gone for a meeting or something more important which must have given them such opportunity. 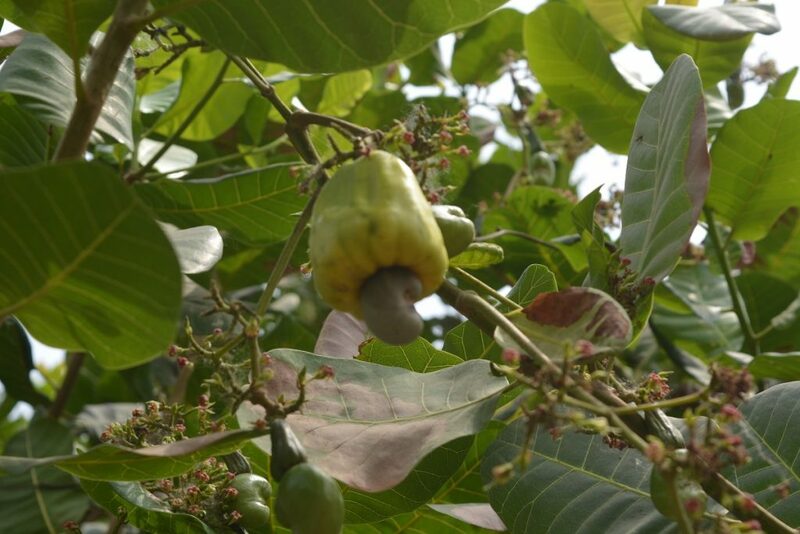 I reached for a ripe cashew hanging on the tree and devoured it on the spot. You know that garden of Eden feeling? Next was the Court of justice which was directly facing the prison. This is the spot where execution by hanging takes place. The marketplace and the mausoleum where kings are buried. 25 kings have already been buried in this building. The 26th king who is currently 91 years old will after his death be buried alongside his predecessors here. Intrigued by the smallness of the mausoleum, I asked how 25 kings fitted well inside it. Mr Paul smiled before explaining that there are numerous ways of going about the burial in Yoruba Land. One of such is by beheading and splitting other body parts of the king to all important parts of the land. The heads most of the times are kept in this mausoleum. I made sense out of this narrative. 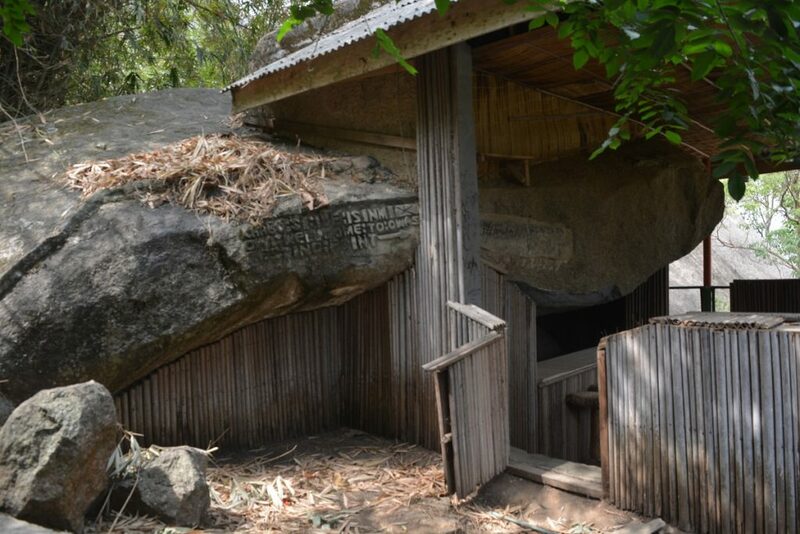 This stone (located right in front of Chief Ojomu’s house) served as the true test of marriage capability in the ancient Idanre. 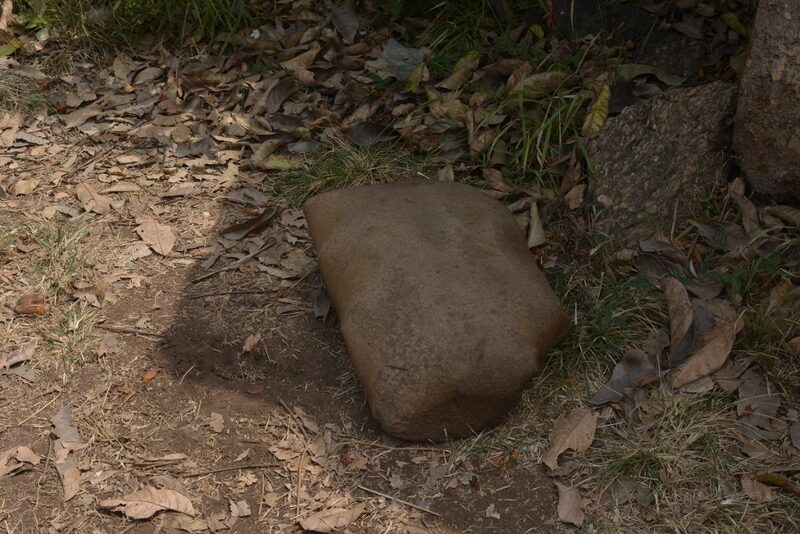 A man will not be allowed to get married to his fiancée if he fails to lift this stone. 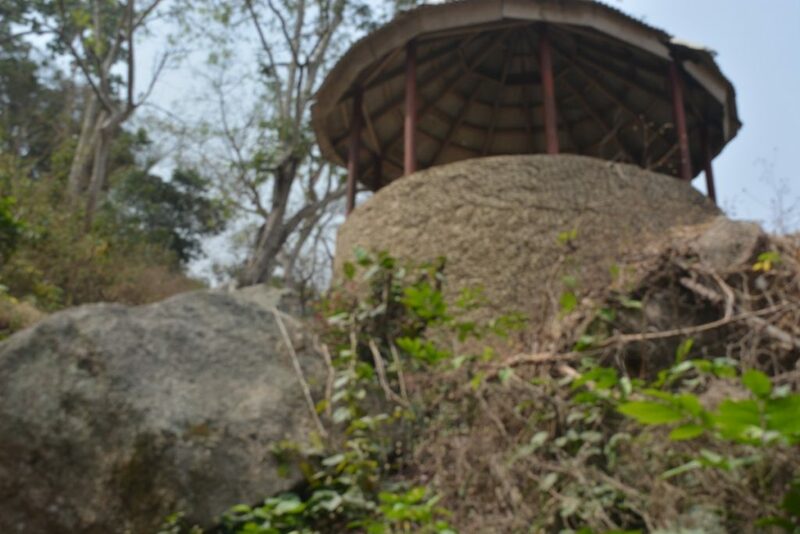 Chief Ojomu is one of the highly placed chiefs in ancient Idanre. I asked what makes it wonderful and he pointed to the small piece of rock preventing it from rolling over. it’s been like this for donkey years. What if it decides not to be wonderful again and rolls over? 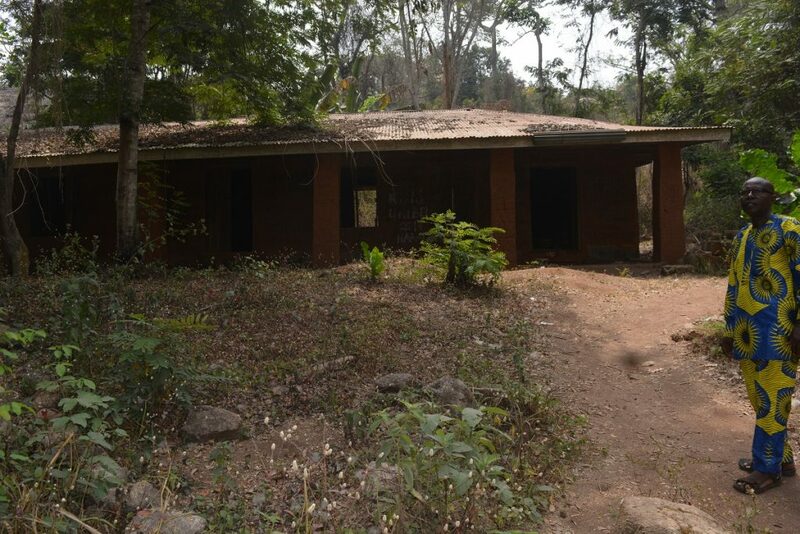 The Ancient palace which also doubled as the conference center was fully guarded by warriors and slaves from several parts of Nigeria. When Mr Paul announced that we had come to the end of our adventure, I was more than fulfilled as I happily descended the steps faster than I had ascended. 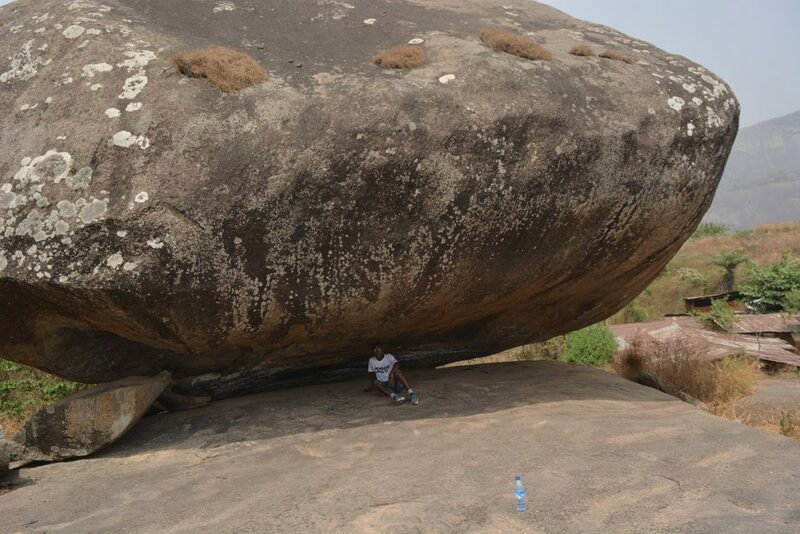 I met other tourists who were just starting and like we normally do to ourselves, I encouraged them, assuring them of an adventurous climb, sharing some of my ‘agbalumo‘ with those who cared for some. 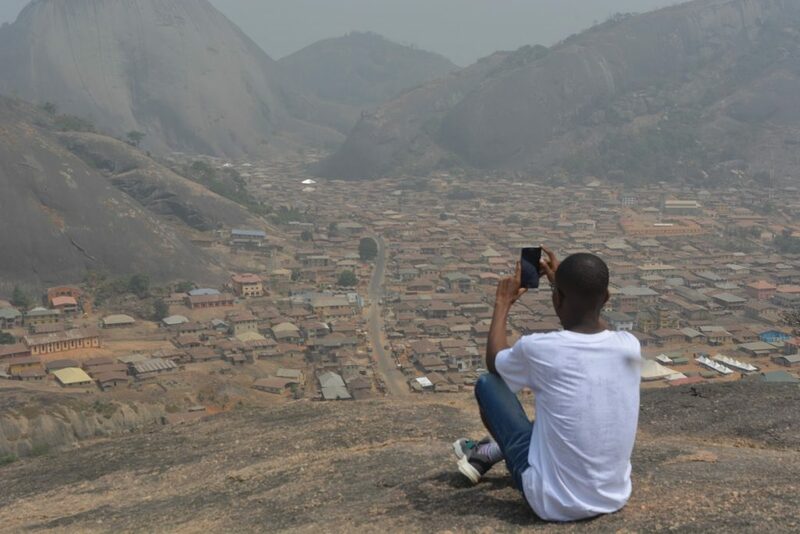 I Left Idanre hills very happy and accomplished at the same time for I had successfully visited every important destination in South-west Nigeria. The sun soon unleashed its cruel side on me on venturing outside the gates of the resort. I was down on cash so I stopped at a bank adjacent the monument to stuff my pockets with more cash. 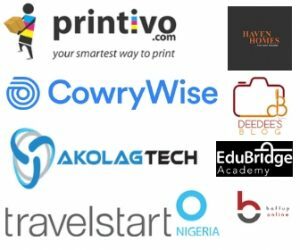 My mind continued to say more prayers for Mr Tayo Sonuga as the machine screeched incoherently to vomit a stack of newly minted notes. I joined a cab on transit to Akure on the same street. This was few minutes past 2pm and arrived Akure 30 minutes later, parting with N300. A bike was all I needed to get to Ondo Garage where vehicles taking passengers to Okitipupa, from whence I’d join another cab to Igbokoda where I planned spending the night. I paid another N1,700 for the trip. We all found ourselves on the busy streets of Okitipupa by 5:30pm. 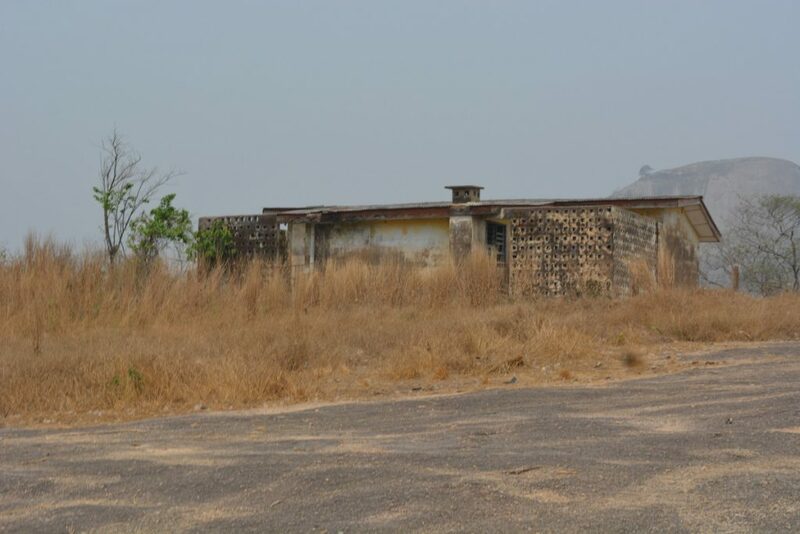 An old blue cab in its obsolescence was on standby to convey passengers to Igbokoda and since 5 of us from the previous bus were heading to Igbokoda, the ignition (consisting of two wires) was tweaked to declare the commencement of our journey. 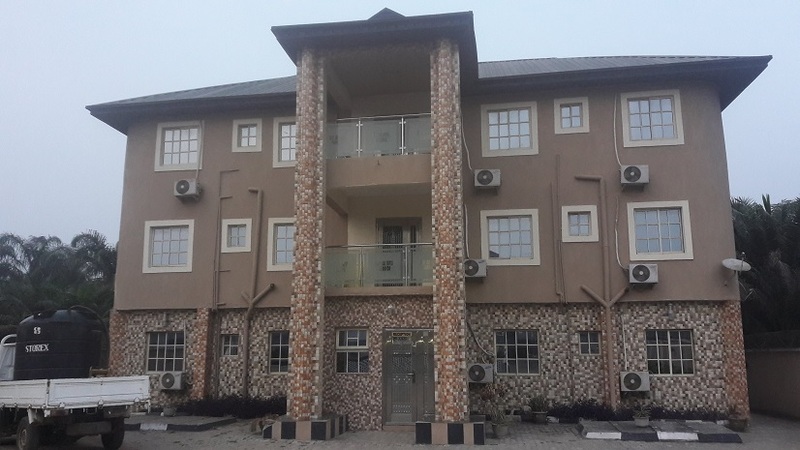 On alighting, I flagged down a bike which took me straight to Deep sea Hotel, where according to Wole is one of the best in town. 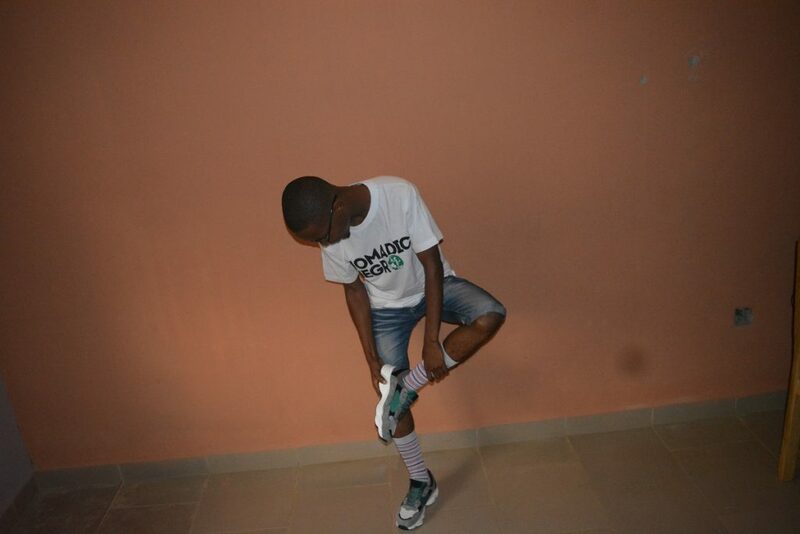 Wole is a great supporter of my blog who is also an indigene of Igbokoda, so I believed him. 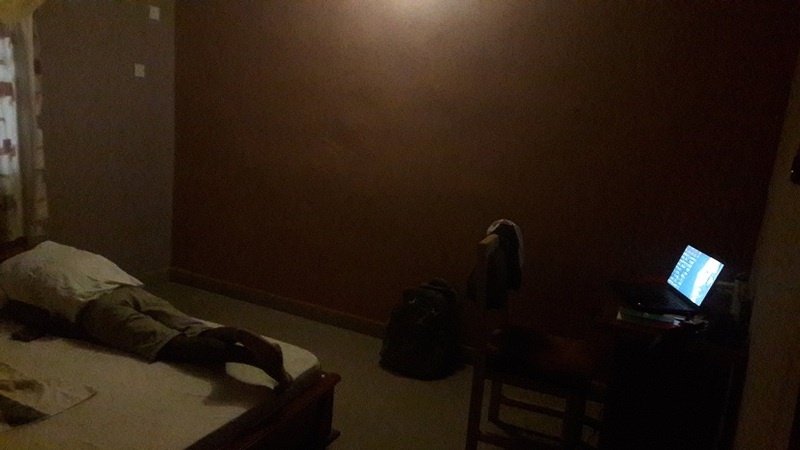 Got to deep sea hotel around 6:40pm, demanded for a room and was told it costs N7,000 to pass the night, but on looking at the surrounding, I could tell that the patronage was somewhat low so I haggled the price till we settled for #5,000. There was no power supply so I seized the moment to see more of the town by paying a biker #200 to take me on a round trip to which he agreed. I stopped by at a roadside in the heart of Igbokoda to buy bread with fried eggs. Stopped by another store to pick up 2 bottles of water and orange juice. I sighted a fish seller opposite the store and bought a full roasted fish for myself and my biker who rode like a cursed horse back to the hotel. The generator set had been switched on on my return, and Just like a lady on makeup, the bulbs unveiled the true beauty of the edifice. I slept Like a baby. I needed to be refreshed for my trip back to Lagos. I took dinner while watching a movie on Startimes featuring Odunlade but sleep became jealous that the TV was getting my attention so it took me away. Hold cash as there’s no POS there. Ensure you buy a proper hiking footwear. You need to negotiate your way all through. Take as much water as possible along. Go with someone who knows how to take good pictures. Thanks for reading this far. Drop your comments if there’s anything you want to ask me or send a mail to tunde@nomadicnegro.com, I’d answer within 24 hours. Please follow me on Instagram and Twitter @nomadic_negro. I just launched my youtube channel and would need your support by subscribing here. Previous articleIkogosi Warm and Cold Spring Is Over-Hyped? 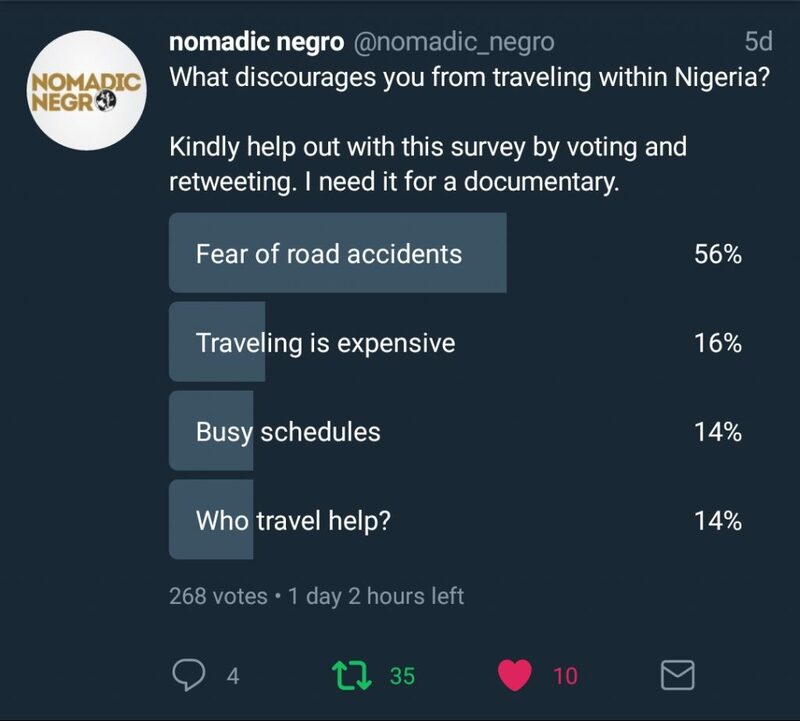 Next articleWhy Do Nigerians Hate Traveling Within Nigeria? Great write up. You give us something to long for. Thanks for all the details. This means a lot to me! I’m glad you admire adventure too. Please start here in Nigeria. Pleade let me know when you start Turi! We need to really show Nigerians and Africa what we have inside here. Educating and entertaining awsome guys like you is why I’m doing this. I won’t stop. Nice write up, my adventurous wife has always encouraged me to take a trip with her, i reckon we will add this to our travelling schedule this year. Please ensure you do sir. It’d be worth your while. I met some tourist couples and couldn’t appreciate less how delighted they were (especially the wives).